I’ve always wanted to make a custom stamp for our shop and a few months ago I started sketching some designs. 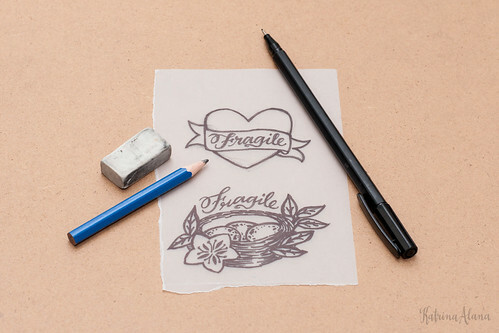 We were using the air mail stickers from the post office and a generic self-inking stamp that says fragile. I fancied something that looked bespoke but functional so that our packages were infused with a bit more personality. I’ve been very fond of sparrows lately, so I decided to base the design of the air mail stamp on that. I had also made a hand–carved stamp a few months ago which we used to decorate the notebooks that we gave away for our calligraphy workshops. When I finished sketching the design, Lex pointed out that the sparrow holding a ribbon said fragile instead of air mail. I was so excited to start working on the next design that I mixed-up some of the design elements. I wanted both the stamps to tie-in somehow so I decided to make the Fragile stamp a bird’s nest with eggs. I later scanned and digitized my design to prepare them for production. 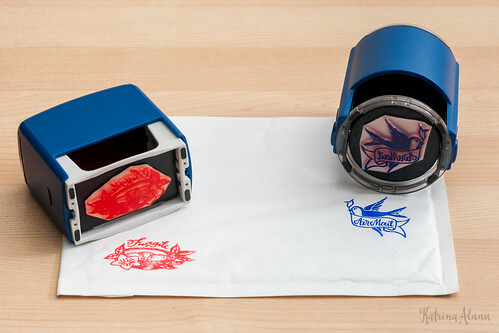 We decided to have self-inking rubber stamps made as opposed to flash stamps since they provide a better quality imprint and they do not tend to bleed into the paper. Overall I’m very pleased with these bird air mail and fragile nest stamps and how they turned out. 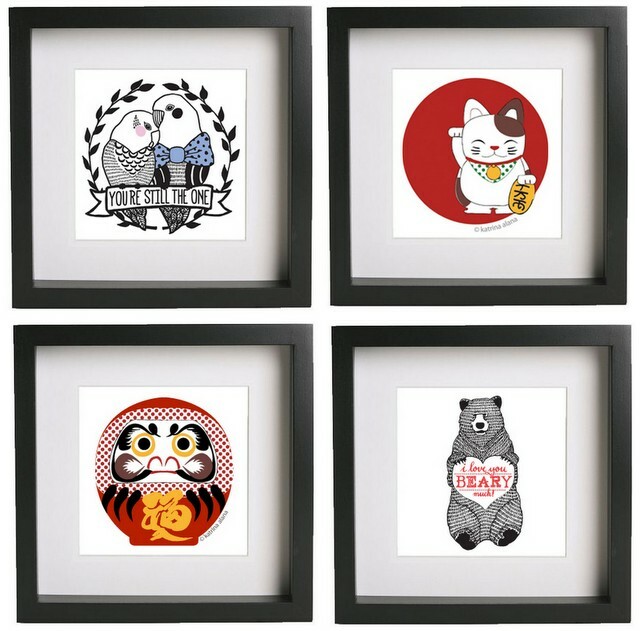 If you would like to purchase these, they are now for sale individually at our online shop. This entry was posted in Katrina Alana Products, Portfolio and tagged air mail, bird, branding, eggs, katrina alana, nest, rubber stamp, sel inking, self-inking, sparrow, stamp on June 11, 2014 by Katrina Alana. 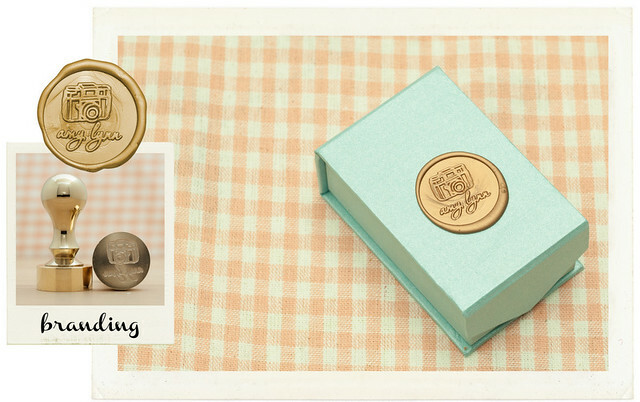 We’ve uploaded some new wax seal designs at the shop to showcase our products better. These great shots are courtesy of Photosaurus Studio. 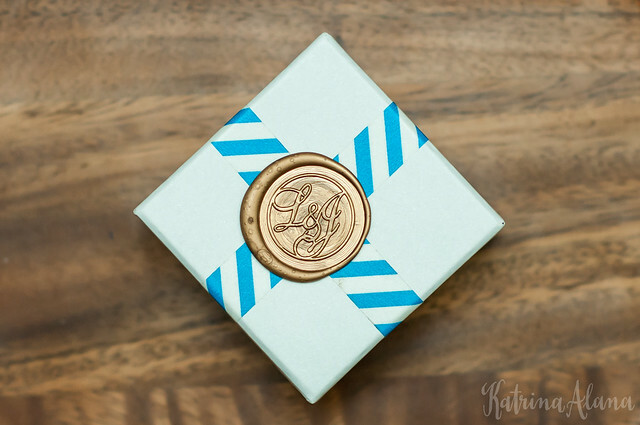 This entry was posted in Katrina Alana Products and tagged custom, monogram, personal, Wax Seal, Wedding on February 24, 2014 by Katrina Alana. I was interviewed by Lisabel Ting for her column, Get Crafty, last week and I provided the steps on how to make a cake topper. The photos are courtesy of Lex under Photosaurus-Studio.com. 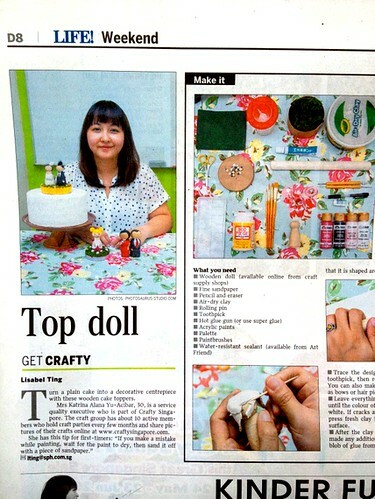 Grab a copy of The Straits Times today, to see detailed instructions on we make our cake toppers. NOTE: We will hold another workshop this month. Sign-up to our mailing list to get updates on our next schedule. This entry was posted in Katrina Alana Products, My Projects and tagged birthday, cake, cake topper, craft class, figures, figurine, Get Crafty, katrina alana, Lex Acibar, Lisabel Ting, Photosaurus Studio, Photosaurus-stucio, The Straits Times, Wedding, workshop on May 31, 2013 by Katrina Alana. 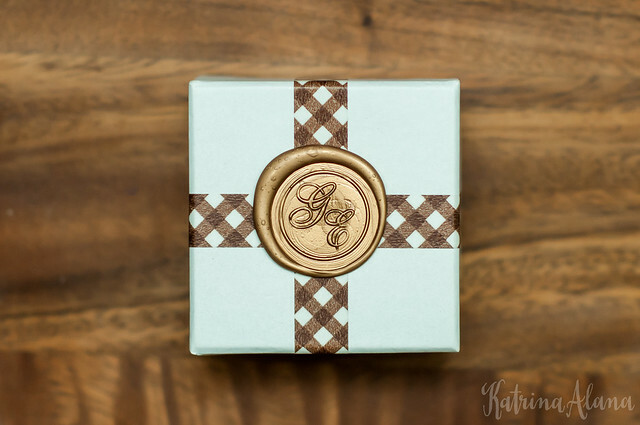 This entry was posted in Katrina Alana Products and tagged Amanda, client, custom, Mavis, Wax Seal, Wedding on October 16, 2012 by Katrina Alana. 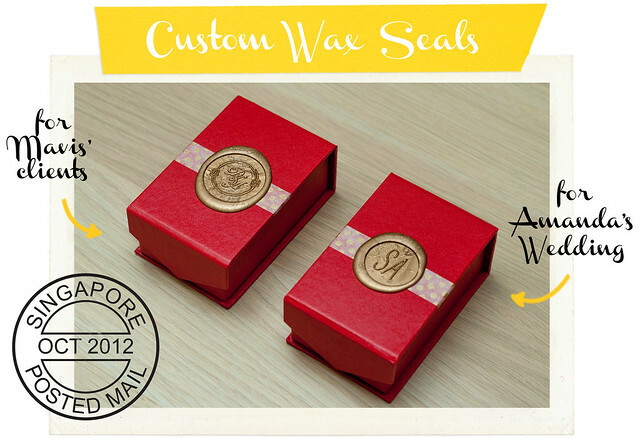 We’ve gotten orders for wax seal for personal branding from two photographers. I think it’s a lovely touch to receive your photos packaged in something so traditional and surprising. Amy Lynn is an amateur photographer from Indiana. You can visit her blog and Facebook page to see more of her work. The seal with triangles and circles is a personal seal for Stephen and third seal is for Spyke who is a photographer from Singapore. This entry was posted in Katrina Alana Products and tagged amy lynn, custom, how to use sealing wax beads, Photography, spyke, spyke shots, wax, Wax Seal on October 4, 2012 by Katrina Alana. We will be launching new products on our store soon. 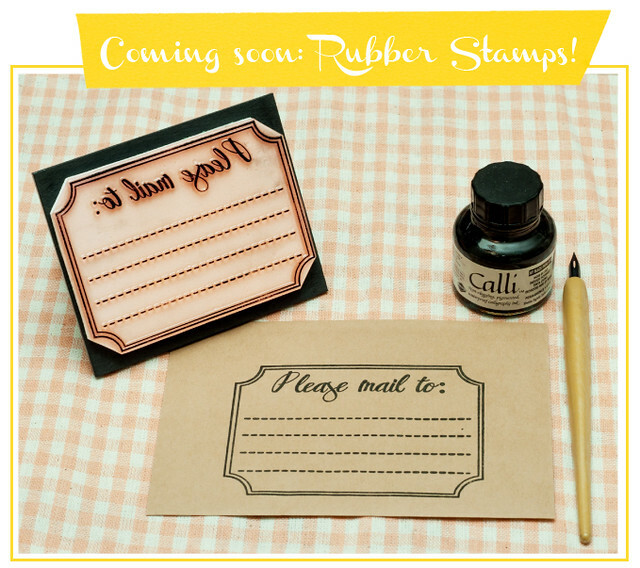 We’re launching our very own line of rubber stamps. One of the upcoming stamps will be address stamps for envelopes, like the one we have here. Stay tuned! This entry was posted in Katrina Alana Products, My Projects and tagged address, rubber, rubber stamps, stamp, stamps on September 25, 2012 by Katrina Alana. 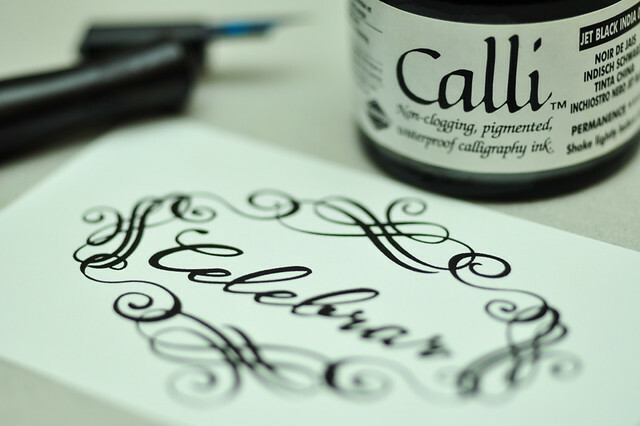 I designed a logo for Celebrar Events inspired by my love for calligraphy. 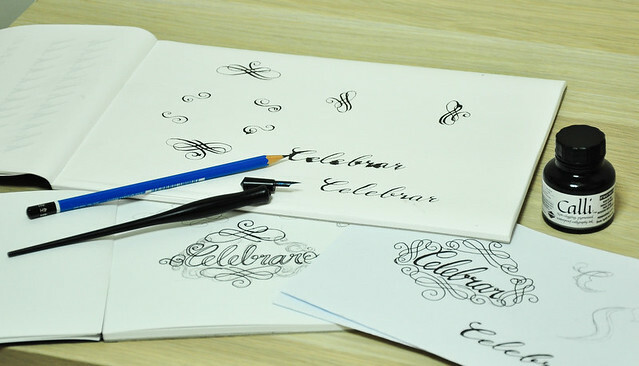 Celebrar is a start-up event management service based in the Philippines. The owner wanted an elegant logo that would pair well with the dark and metallic palette she chose. 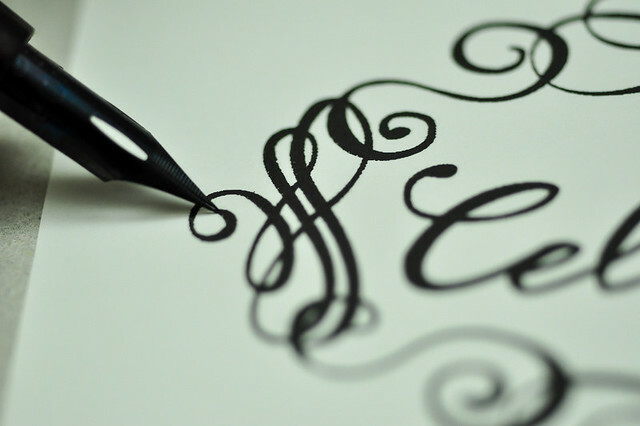 I hashed out my ideas on paper, trying to come up with flourishes for the border. The drafts were scanned and traced using Illustrator. I’m waiting to hear from the client on how she feels about the logo. Now I’m going to start designing the business cards and other stationery for her branding kit. 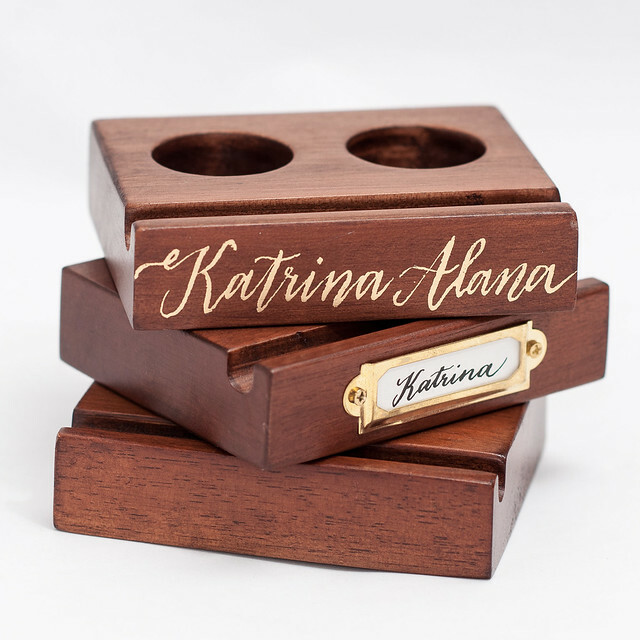 This entry was posted in Katrina Alana Products, My Projects and tagged branding, Celebrar, Celebrar Events, coordinator, design, designer, logo, Wedding on September 6, 2012 by Katrina Alana. 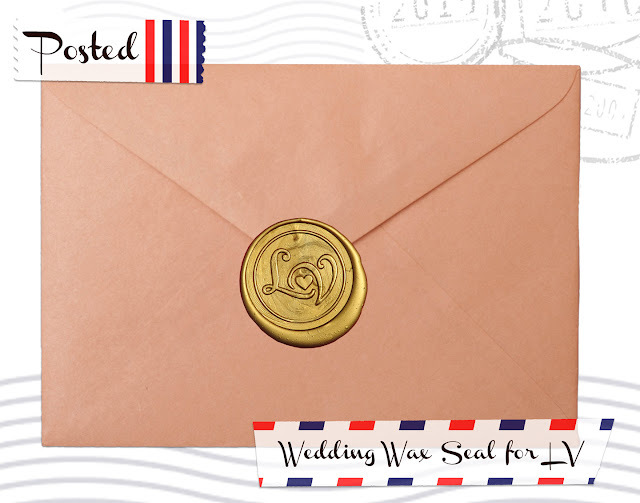 We got an order for a wedding wax seal from the lovely Ms. V. She had a design prepared and we just helped her transform into a seal. It’s always a pleasure working with a great customer. 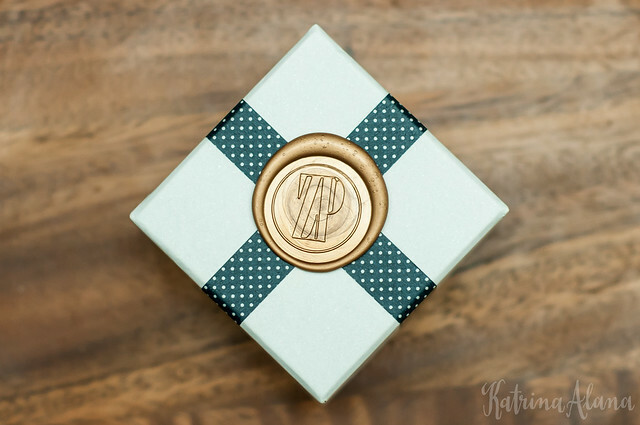 This entry was posted in Katrina Alana Products and tagged custom, posted, Wax Seal, wedding LV on August 24, 2012 by Katrina Alana.